It is a really special moment in a couple’s life when they get married. Each year after is cause for a great celebration to mark the anniversary! Let Flamingos 2 Go help make your anniversary, your parents or grandparents’ anniversary a time that they will treasure always! Our Anniversary Yard Decor is the most unique gift, and it looks amazing as you drive in! 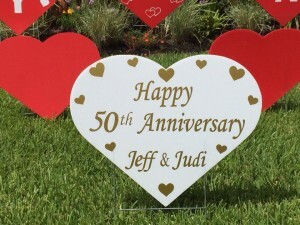 Special 50th Anniversary Yard Greeting also includes gold 50th decor. Keepsake Heart is also available with your choice of red or white heart with two first names, first names + anniversary number. What an amazing unique gift for the golden anniversary! You can mix in lots of other options, but the most popular, by far, is a yard full of hearts. Would you like to book this special Anniversary yard greeting theme or get more information? Just fill out our Booking Request Form, and we will be happy to send you more details & help arrange for your special gift to be delivered.